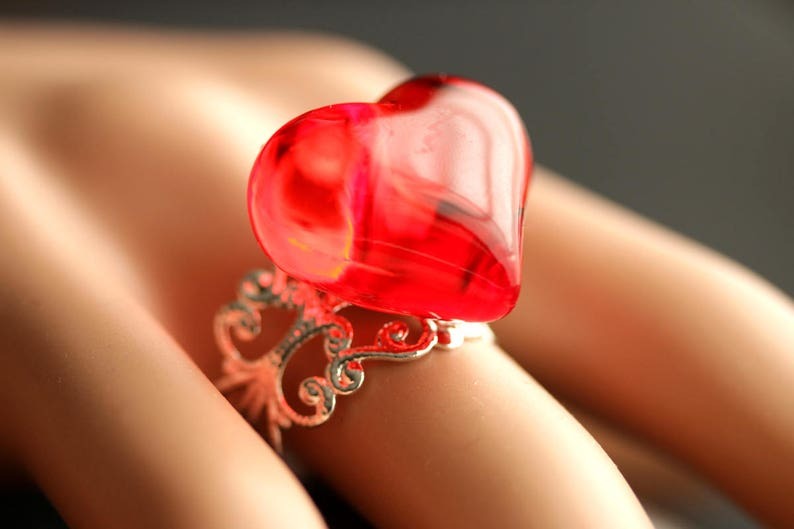 A fun Valentine themed ring designed with a bright red puffy acrylic heart that has been set upon an adjustable filigree ring base in your choice of finish in this handmade that's adjustable from size 6 and up. This handmade ring is adjustable from size 6 and up, making it comfortable no matter the size of the wearer's fingers as well as ideal for switching from finger to finger depending on mood or preference. Red Heart Earrings. Silver Heart Earrings. Post Earrings. Sparkle Heart Earrings. Stud Earrings. Handmade Earrings. Handmade Jewelry. EASTER SALE Sage Green Rose Ring. Green Flower Ring. Gold Ring. Silver Ring. Bronze Ring. Copper Ring. Adjustable Ring. Handmade Jewelry. Hot Pink Rose Ring. Fuchsia Pink Flower Ring. Gold Ring. Silver Ring. Bronze Ring. Copper Ring. Adjustable Ring. Handmade Jewelry. EASTER SALE Star Ring. Red Ring. Red Star Ring. Silver Filigree Ring. Adjustable Ring. Handmade Ring. Handmade Jewelry. EASTER SALE Dark Red Glass Ring, Bronze Ring. Brick Red Ring. Lampwork Glass Ring. Cocktail Ring. Adjustable Ring. Handmade Jewelry.